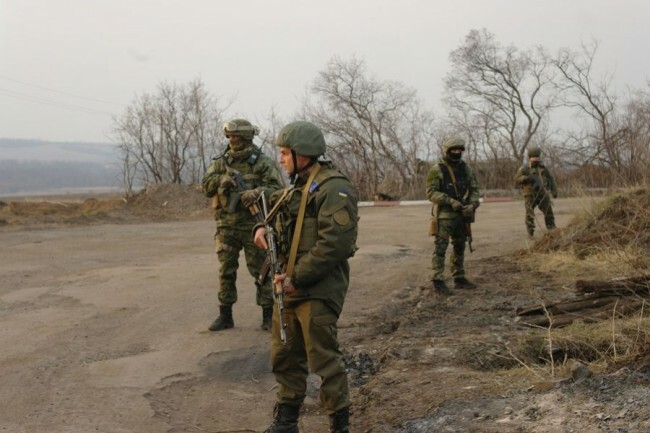 All roads and railway lines leading to the frontline in Donbass have been cut off by the Ukrainian National Guard, National Police, and State Border Guard Service. More than 800 troops have been deployed to checkpoints on the Ukrainian side of the frontline in Donbass. The blockade checkpoints are reportedly being reinforced with military vehicles. 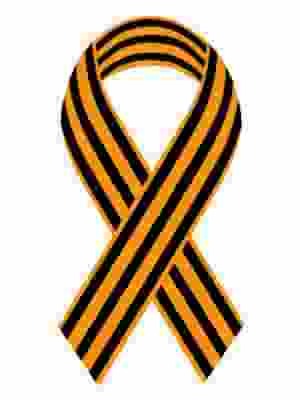 “Pursuant to the decision of the National Security and Defense Council of Ukraine, today all roads and railway lines leading to the demarcation line have been blocked by forces of the National Guard, National Police, and border guard services in order to ensure control over and prevent the illegal movement of goods,” the National Guard’s statement reads. 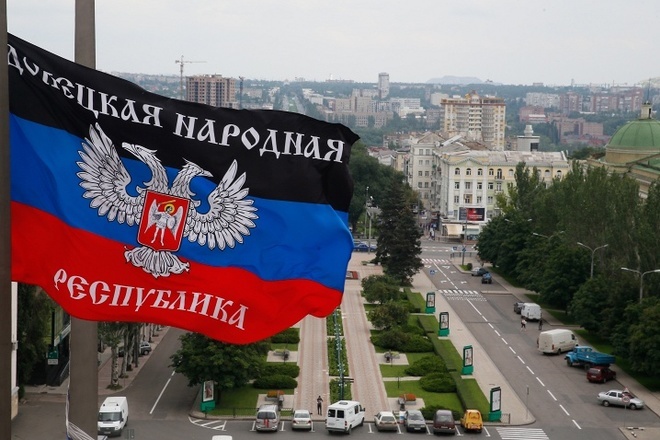 This escalation comes on the heels of Ukrainian President Poroshenko’s ultimatum to the Donetsk and Lugansk People’s Republics to reverse the nationalization of Ukrainian enterprises. 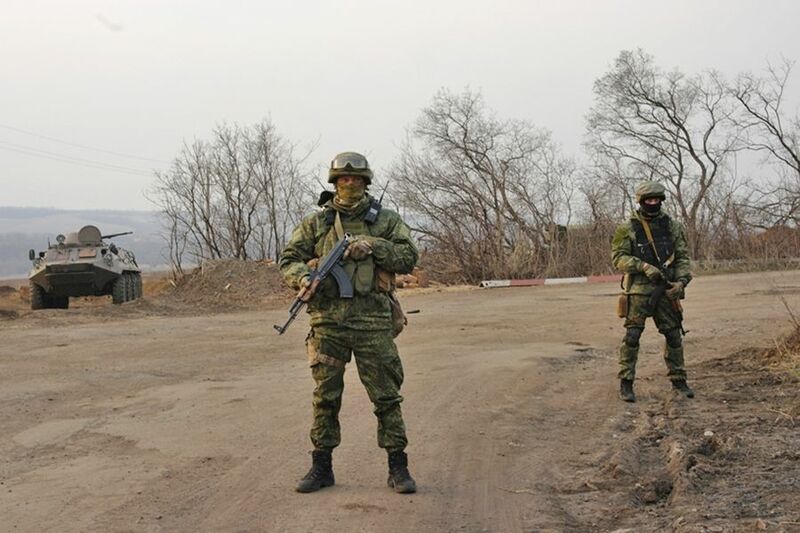 This new Kiev-enforced blockade follows the recently dispersed blockade of Donbass railways by neo-Nazi battalions who demanded that all trade with the Donbass republics be terminated. The government’s failure to suppress the latter initiative on the demand of the Donbass republics provoked the nationalization of hitherto undisturbed Ukrainian enterprises on the territory of the people’s republics. 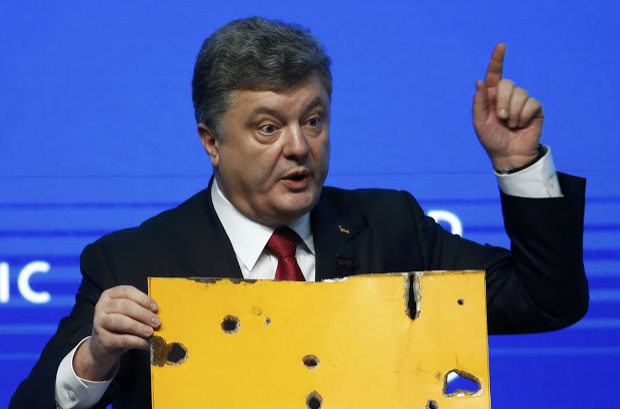 “We say: please return enterprises to Ukrainian owners…comply with points one and two of the Minsk Agreements, meaning cease-fire and withdraw heavy equipment and artillery, and we’ll remove the restrictive measures on the movement of goods across the contact line,” the president stated. In addition, Poroshenko threatened to impose sanctions on Russia if Donbass sells goods manufactured at the recently nationalized factories to Russia. “The decision of Porsohenko and the National Security and Defense Council is the internal affair of former Ukraine. More precisely, this is a fact of internal power struggle in Kiev which Poroshenko seems to be losing. We don’t have any relationship to this whatsoever,” Zakharchenko stressed, adding that Donbass has its own blockade in force which will be lifted only when Kiev fulfills its part of the Minsk Agreements. If participants in the trade blockade of Donbass do not reach their goals, they plan to sever the supply of electricity and water to the republic to create “intolerable conditions”, typical of the inhumanity of extremist factions and fascists who lack humanitarian understanding of populations and their needs. This was stated by the second commander of the dangerous and extremist battalion “Donbass”, Anatoly Vinogrodsky, a virulent ultranationalist and fascist sympathizer. “We will close the supply of all goods, electricity and water, which will flow into the occupied territory, in order to organize unbearable conditions for the population, so they began to harass Zakharchenko and his minions”, Vinogrodsky stated bluntly. As of today, March 1st, external management will be introduced at all unregistered Ukrainian enterprises on the territory of the Donetsk and Lugansk People’s Republic. This decision was taken by the leaders of the republics in response to the transport blockade of Donbass. 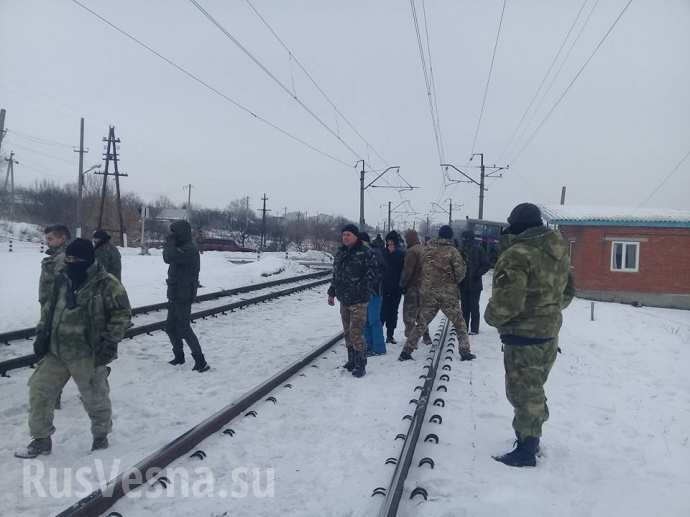 In late January, a group of veterans of the military operation in Donbass, including deputies of the Verkhovna Rada of Ukraine, blocked freight rail traffic from the Donbass republics at several points. 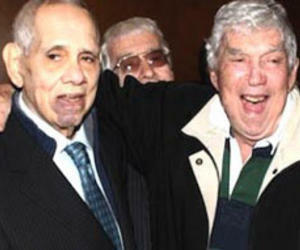 The “blockaders” stated that in their opinion any trade with the self-proclaimed republics is illegal. The blockade has led to shortages of anthracite coal which is mined in the areas of Donbass uncontrolled by Kiev. In connection with this, Ukrainian authorities have been compelled to introduce emergency measures in the energy sector with the aim of saving resources. A number of industrial enterprises have had to stop production. 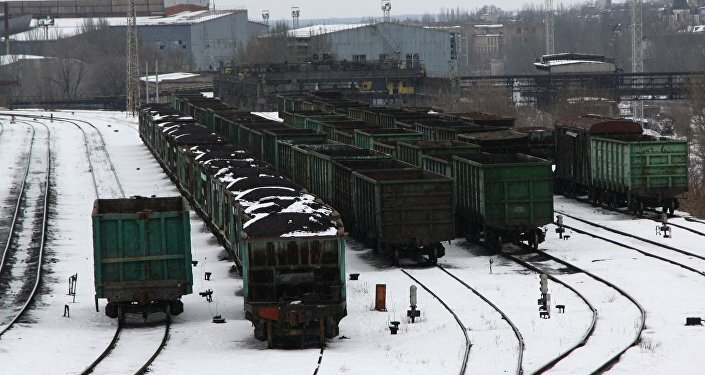 On Monday, February 27th, the heads of the LPR and DPR announced that the republics would cease coal deliveries to Kiev if the railway blockade continues. In addition, they promised that if by midnight of March 1st the blockade is not lifted, then external management will be introduced at all enterprises under Ukrainian jurisdiction working in the DPR and LPR. Due to the transport blockade, a number of large enterprises around the frontline in Donbass have ceased production. Among them are the Enakievsky metallurgical factory in the DPR and the Krasnodonugol company in the LPR. Both of these factories are part of the Metinvest group belonging to Ukrainian oligarch Rinat Akhmetov. During emergency sessions of the DPR and LPR parliaments on Monday, the relevant amendments to legislation were adopted which allow for external control to be imposed on Ukrainian enterprises that are not registered on the territory of the republics by March 1st. The DPR and LPR have announced the creation of a special headquarters for controlling Ukrainian enterprises’ transition to external management. The LPR has emphasized that the employees of these enterprises will keep their jobs. 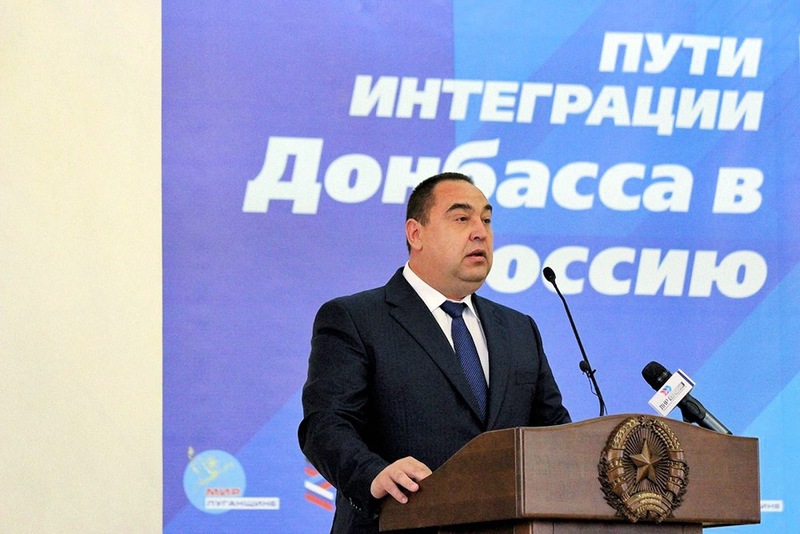 The chairman of the LPR’s People’s Council, Vladimir Degtyarenko, said: “The established headquarters intends not to merely keep enterprises ‘afloat,’ but to contribute to their further development and reorientation towards Russia.”…. Representatives of Donbass have explained that this decision on “nationalizing” Ukrainian enterprises was necessary. The primary task is resuming their work and saving jobs. But this, according to DPR head Alexander Zakharchenko, will take about two months. “In the short term we will have to rebuild industry and change markets. The main task is ensuring the smooth operation of enterprises and salaries and work for the workers of these enterprises,” Zakharchenko said. The Ministry of Industry and Trade of the DPR has stressed that there can be no doubts that the enterprises will be successfully reoriented from the Ukrainian market to markets in the Russian Federation and other countries. In addition, the transfer of all enterprises of non-residents to republican jurisdiction only broadens the foreign trade ties of the DPR. “Despite difficulties with the political recognition of the republic, our enterprises are quite successfully working with countries in the near and far abroad. For already more than two years, our manufactures have essentially begun the process of withdrawing from Ukrainian markets in favor of other countries. Both the state and business circles have some experience in this,” the acting industry and trade minister, Aleksey Granovsky, affirmed. Granovsky added that the republic is now exporting more than 50 types of goods among including from light industry, food products, chemical and pharmaceutical industries, and metallurgy. Le Figaro relays this despatch of Reuters which tells us that Russian hackers have broken in to Ukraine’s power grid! Really ! The state of Energy Emergency was set up by the Ukrainian government following this internal crisis. There would be only 14 to 100 days left of coal to allow their power stations to stay in operation. The Figaro and Reuters (not the only ones) by relaying this vulgar propaganda worthy of a bad soap opera, thus absolve in advance the negligence into which Ukraine has fallen since the Kiev putsch of 2014. For if, unfortunately, some power stations were to cease functioning as a result of this blockade, all eyes will inevitably be directed against the ugly Russian hackers rather than against the Kiev regime. Russian hackers elected Trump — at least in the mainstream press. Russian hackers are hijacking power stations in Ukraine. In France, Russian hackers broke into the site of Emmanuel Macron! Oh yes, this is the latest trendy joke! The Russian hackers will even threaten the elections in France and Germany! Now that goes to show you how powerful these Russians are! To get back to this blockade: who can make me believe that the police and the Ukrainian army can’t get this little mob off the railroad ??? RFI [Radio France International] Kiev is using these useful idiots to once again to clash with Russia and increase international pressure against Vladimir Putin. He is no longer a president, but an octopus! Who benefits if the power grid is shut down? Not Russia. Certainly not with the nuclear reactors next door. Russia has the most to lose. So who benefits? This is a false flag. …He said the attacks employed a mechanism dubbed “Telebots” to infect computers that control infrastructure. ESET said it believed that Telebots had evolved from BlackEnergy, a hacking group that attacked Ukraine’s energy industry starting in December 2015 [on December 23]. The December 23, 2015 attack was a highly coordinated attack on a day that the hackers perhaps deemed significant. If so, that would indicate a EU or U.S. team responsible for the hack; they celebrate Christmas on December 24-25, and probably think everyone else does, too. Ukraine celebrates Christmas in January, and any Ukrainian and Russian would know that. Other suspects are the oligarchs and their minions who fight against each other, and the militias in the West of Ukraine angling for control of Kiev.